On the run from unjust court-martial back home, a young British soldier gets robbed and shot on Copacabana Beach. The bullet in Jake's head should have been fatal, but miraculously, it saves him from a previously undetected condition that soon would have killed him. Jake doesn't believe in fate, nor does he feel he owes anything to anybody, but he does hate injustice. Vilson, the teenage favela kid who fired the bullet, is a victim of injustice, in a corner with a corrupt cop and a sadistic drug-lord after his blood. 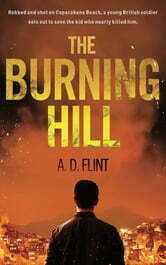 With a turf war erupting in Vilson's favela, fear stalks every narrow alleyway, and anyone dragged up to the notorious Burning Hill had better hope they're dead before they get there. But it's not just fear that shapes life in the favela, belief is also powerful, able to both save and destroy. The Burning Hill is about the power of belief and one man's desire for justice at any cost.